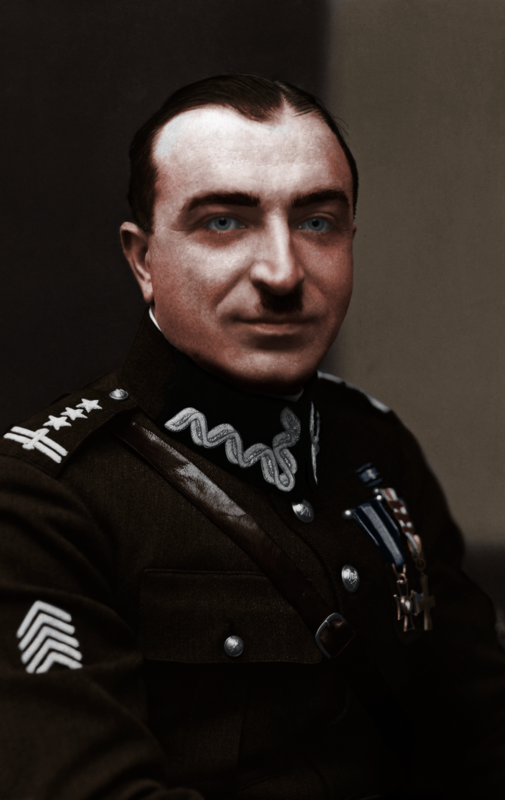 General Wilhelm Orlik-Rückemann, was one of the few Polish commanders who decided to fight the Soviet invasion in September 1939. The Border Protection Corps (in Polish: Korpus Ochrony Pogranicza, KOP), under the command of General Wilhelm Orlik-Rückemann, an assimilated Polish Jew, became the symbol of armed resistance against the Soviet aggression on September 17, 1939. During the First World War, he joined the Polish Legions and participated in the toughest battles fought by the First Brigade. In the battle of Laski-Anielin, he was wounded in the arm by a Russian bullet. Together with his gray-uniformed colleagues he “put his life at stake”, believing that their sacrifice would bring the dawn of freedom to the Polish homeland. In July 1917, he was forcibly incorporated into the Austrian army, when, following orders from Józef Piłsudski, he refused, together with other legionnaires, to take an oath of loyalty to the German Emperor. At the same time, he was active in the secret structures of the Polish Military Organization. When Poland returned to the world map in November 1918, he immediately enlisted in the army and took part in battles with Ukrainian troops for national borders in the South-Eastern Frontiers. Near Mikulińce in Podolia, his unit was captured by the Ukrainians. “One Ukrainian unit, together with its officers, took an hour to torture the prisoners” recalled one of Rückemann’s soldiers. “The prisoners were set against the wall and after calling them to <Attention>, with shouts <You want Poland? !> they were beaten on their faces with fists and riffle butts.” Under these conditions, he stayed in captivity until April 1919. When he was freed by an offensive of the Polish army, he immediately took part in the war against the Bolsheviks. He participated in the famous Kiev expedition, which was supposed to provide armed support to the fulfillment of Piłsudski’s federation plans. He made himself famous in the Battle of Borodianka, for which he was decorated the highest military order Virtuti Militari, which, next to the three Crosses of Valor, proudly decorated his chest. Just before the Battle of Warsaw in 1920, a decisive struggle for the independence of Poland and the fate of Europe, Rückemann was promoted to the rank of lieutenant colonel and took command of the 1st Tank Regiment. In the interwar period, Wilhelm Orlik-Rückemann was entrusted with several command duties. After being promoted to the rank of brigadier general in December 1938, he became deputy commander, and just before the outbreak of the WWII, in August 1939, he became the commander of the Border Protection Corps. The basic task of this formation was to protect the eastern frontiers of Poland, not only against the potential Soviet aggression, but also against the Communist saboteurs. When the war broke out, General Orlik-Rückemann had under his command over 12,000 soldiers serving in three brigades and nine independent regiments. The launch of Soviet aggression found General Rückemann at the command post in Dawigródek next to the Polish-Soviet border, as drawn by the Riga Treaty. Without delay, he made the decision to put up a strong resistance against the overwhelming Soviet forces. In the first line of defense he put the KOP units: Polesie Brigade, Sarny regiment and Kleck Battalion from the regiment in Baranowicze. Initially, the general commanded a section of nearly three hundred kilometers, marked out by the villages of Kleck-Dawigródek-Rokitno-Brzeźno. Despite the unparalleled bravery of Polish soldiers, the Soviet offensive was overwhelming. General Rückemann made the decision to retreat, all the while his troops undertook ad hoc fights with the Red Army, significantly hindering its “red parade” westward. The tactical goal put forward by General Rückemann was to connect with the troops of the “Polesie” Independent Operational Group commanded by general Franciszek Kleeberg and march to Warsaw. The Polish Capital, fighting despite all odds, was the symbol of resistance against the allied aggressors, drowning Poland in a sea of blood. Despite the sacrifice of the KOP soldiers, clearing – mainly at night – distances of more than 40 miles, and during the days fighting both the regular and aerial Red Army squadrons supported by the Communist subversives, General Rückemann’s army did not make it to Warsaw. On the day when the fights ended in the capital, they fought near Szack for a dozen or so hours a great and victorious battle with the 52nd Soviet Infantry Division, which was three times stronger. Three days later, on October 1, 1939, they destroyed Soviet units in the battle near Wytyczno. Both battles, Szack and Wytyczno, along with the defense of Grodno, became the most important symbols of the defense of the Eastern frontiers against the Soviet aggression. After the September campaign General Wilhelm Orlik-Rückemann managed to get to Scandinavia by the way of Lithuania. He wanted to join the Polish Armed Forces in the West. However, he was a staunch Pilsudski-ite, which did not facilitate his relationship with the Commander-in-Chief supported by France and England, General Władysław Sikorski, who prevented supporters of Marshal Piłsudski from assuming command positions. Only after Sikorski’s death did he manage to get to Great Britain, where until the end of the war he remained at the disposal of the Supreme Commander. As a determined anti-communist, and at the same time the symbol of resistance against the Soviets in 1939, he could not to return to Poland after the war. He lived in London, where he earned his living as a watchmaker and later worked at a pastry shop. He joined the group of Polish commanders, who after the war, instead of gratitude, received from the former Allies a humiliating fate leaving them to fight for survival. Others in this group included General Stanisław Maczek who worked as a bartender, General Klemens Rudnicki who became an elevator operator, and General Kordian Zamorski who resorted to being a bookbinder. General Rückemann did not live to see a free Poland. After the death of his wife in 1972, he left for Canada and died there in 1986 as one of the oldest generals of the Second Polish Republic, for whom the service of the Motherland was always the highest order. The author is a historian, the head of the Office For War Veterans and Victims of Oppression of the Republic of Poland.